After Hurricane Irene a few weeks ago, this startling photo went viral on the Internet, and was picked up by TV stations and print media. Here are a few well-known photos and videos. Some are fake—but some are not! Which are which? Update (September 21, 2011): Answers provided. Fake—composite image of a real kayaker and a real whale. (this shows the importance of a good roll—you never know when you might need it!) ……. …………. …………. …………… …………. …….. …….. ….. ………… …………. Fake—from a Korean energy-drink commercial; real whale footage with kayaks added. Real!—famous photo from a photo shoot of great white sharks off the coast of South Africa by Thomas Peschak published in Africa Geographic in 2005. 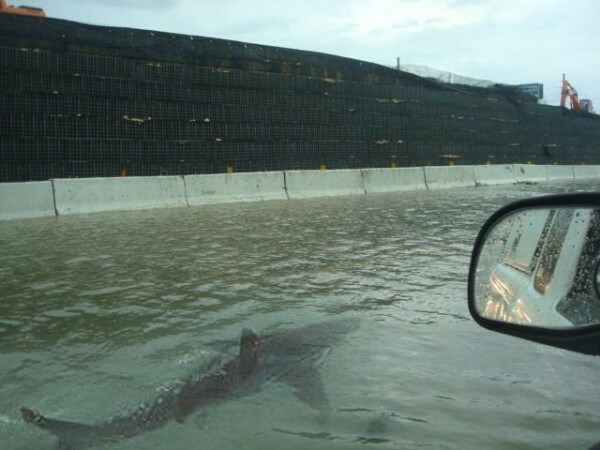 Hoaxers can’t resist this dramatic photo, which has been the source image for a number of fake composites, including the Puerto Rican street shark at the top of this post. Real!—photo taken by Kurt Jones at Malibu, CA, in 2003. But the animal is not a shark, but a dolphin: note the horizontal rather than vertical tail. Truth status uncertain—still being vigorously debated! Fake—composite image of a real parachutist and a real alligator farm. Fake—composite image of real divers and a real shark. Any more candidates for this set out there? This entry was posted in Kayaking, Nature and tagged Alligator, Animal, Dolphin, Hoax, Kayaking, Monster, Orca, Photography, Photoshop, Shark, Surfing, Whale. Bookmark the permalink. Yes! Thanks, Bonnie. Perfect addition—also in that there seems to be vigorous debate about the authenticity of this one, too. The shark with the S.O.T. is real, so is the great white in the surf zone. The others are fake. Except of course the Boriken shark…. Yes! The shark with the SOT is most definitely real—a famous picture, and raw material for many fakes. And the great white in the surf zone is real, except that it turns out to be a dolphin…. The others are indeed fakes. (With the possible exception of the whale crushing the sailboat, added after Taino’s post.) Details forthcoming.